About this object South Carolina Representative James Orr served one term as Speaker of the House. He later served in the confederate congress and army. 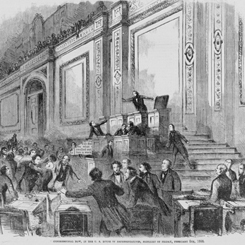 The 35th Congress (1857–1859) opened under Democratic leadership in both the House and Senate, but for the first time Republicans stood as the dominant opposition party. In Kansas, anti-slavery voters boycotted (and the territorial legislature rejected) the pro-slavery constitutional referendum—the effect of which reverberated all the way to Washington. The debate in the House over the Kansas controversy led to a huge brawl on the floor that ended only after one Member’s hairpiece was ripped off. Congress passed legislation for another constitutional referendum that, if approved, guaranteed Kansas federal aid or, if rejected, postponed statehood. The most infamous floor brawl in the history of the U.S. House of Representatives erupted as Members debated Kansas’s pro-slavery Lecompton Constitution late into the night of February 5-6. 1No clear data for this period exist. 2From 1855 to 1861 the local clergy in the District of Columbia conducted the opening prayer. Thereafter, the House has elected a Chaplain at the beginning of each Congress.